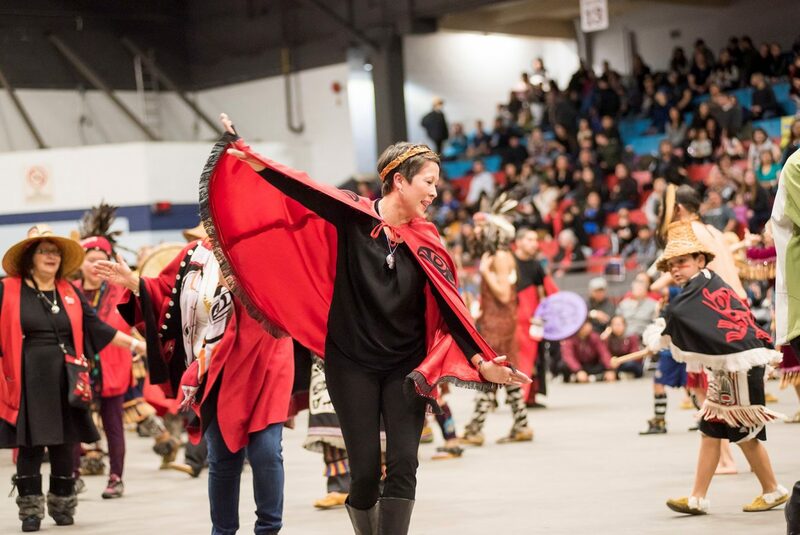 Melanie Mark, MLA for Vancouver-Mount Pleasant, dances during the Grand Entry of all dance groups and dignitaries. Keane Tait is fluent in the Nisga’a language. His Nisga’a name is Wal Aks, from the House of Axdii Wil Luu-Gooda from the Git-Wilt’uuts’kwhl Aks Clan of the Raven/Frog tribe among the Nisga’a People. The “Peace Dance” is an ancient song that was kept alive by matriarch Louise Dangeli. The use of eagle or swan down is considered a gift from the creator that is imbued with high naxnox (power). It is traditionally used to honour the hosts and guests and to cleanse an area. All dancers and elders are invited to the floor to dance. A waxing moon and a star made of paper are suspended from the ceiling to represent the Hobiyee. 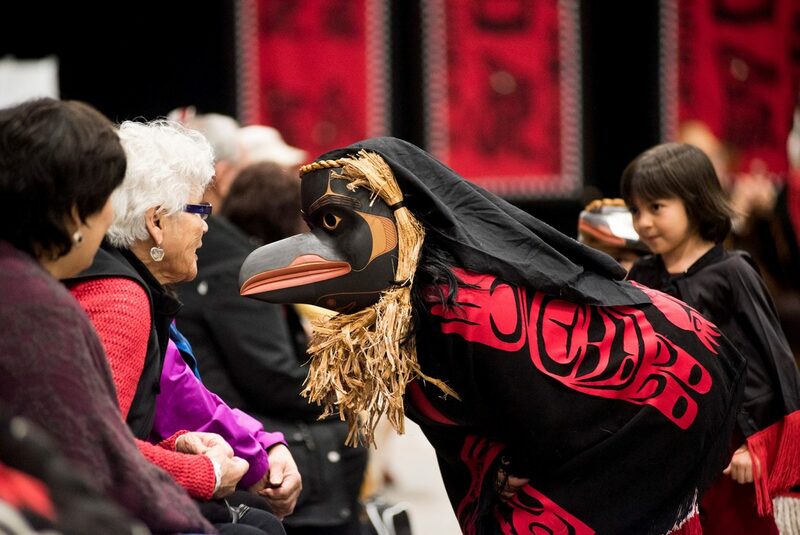 A dancer from the Lax Kxeen Traditional Tsimshian Dance Group wearing a raven mask and regalia teases an elder in the audience. Also known as the trickster Txamsem, this supernatural being is a shapeshifter. 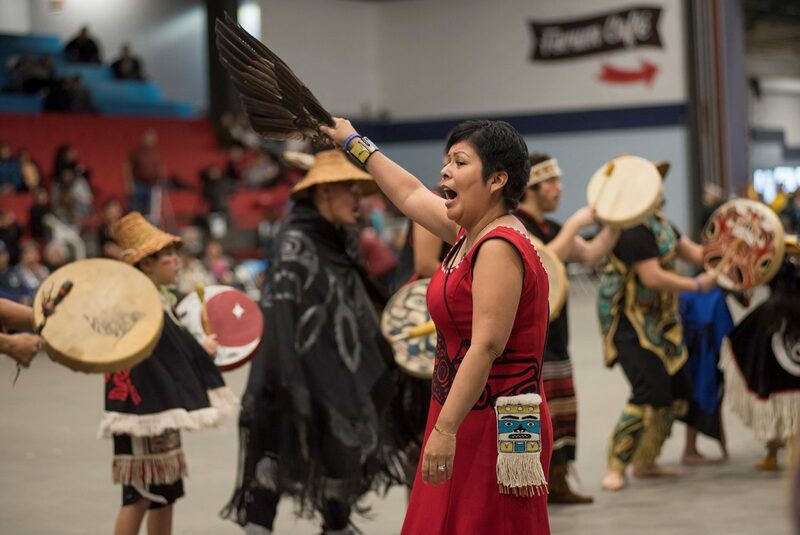 Christine Smith-Martin, who has been dancing since she was a young girl, leads the Lax Kxeen Traditional Tsimshian Dance Group. The group sings songs representative of the four clans (Raven, Eagle, Orca, and Wolf), in addition to songs that commemorate milestones and celebrations in the community. The Photographer’s Dance was created by Dr. Mique’l Dangeli. The regalia and mask were created by Mike Dangeli, and the song is composed by Dr. Douglas J. Worley. 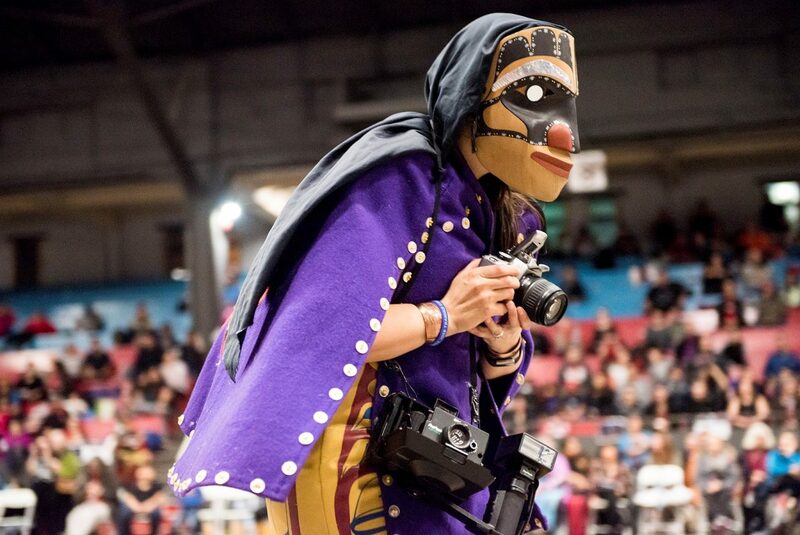 This is a contemporary dance created in honour of the 19th century Tsimshian photographer Benjamin Alfred Haldane of Metlakatla, British Columbia. He was one of the first Aboriginal photographers in North America. Goodspirit, also known by his “cowboy name” Randy Tait, wears a cedar-hat headdress designed with Orca, Owl, and Fireweed motifs. White horsehair is suspended from the peak of the headdress. Goodspirit drums while the school children take to the dance floor. Dr. Mique’l Dangeli performing the Thunderbird Dance. 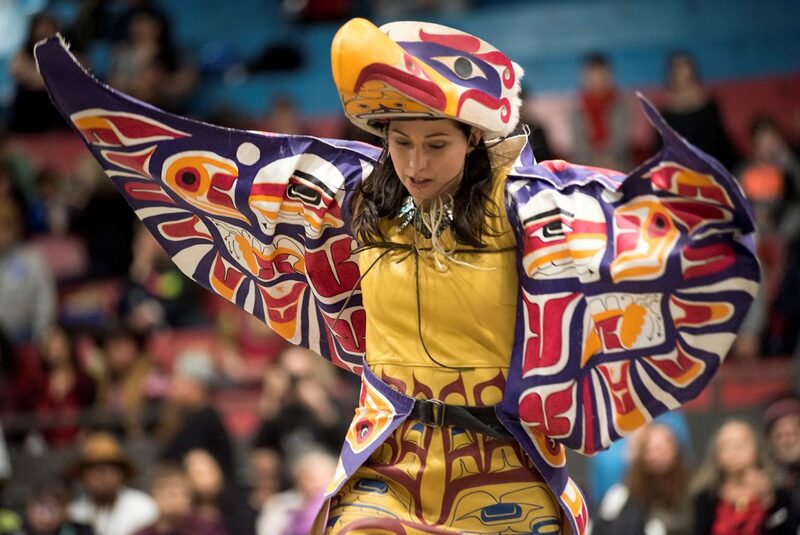 The role of the Thunderbird is to draw attention to prepare the audience to be a witness. 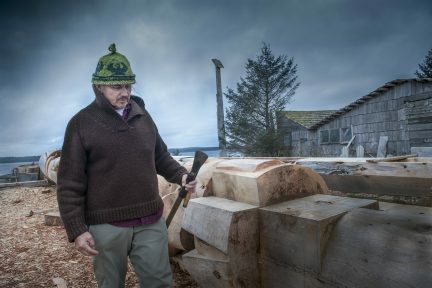 Being a witness in Northwest First Nations culture is a very serious responsibility, as a witness plays a key role in keeping the oral history alive. 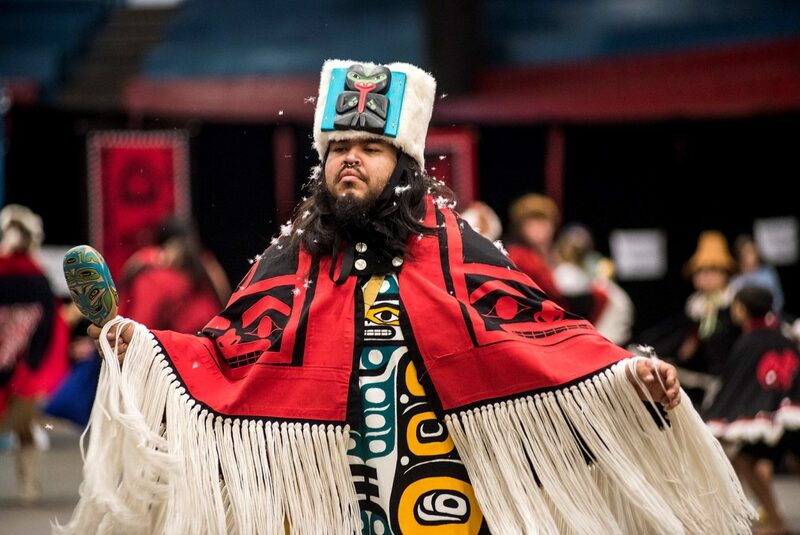 Zachary Tait (Anmogam Dilx) is a member of the Kwhlii Gibaygum Nisga’a Traditional Dancers. 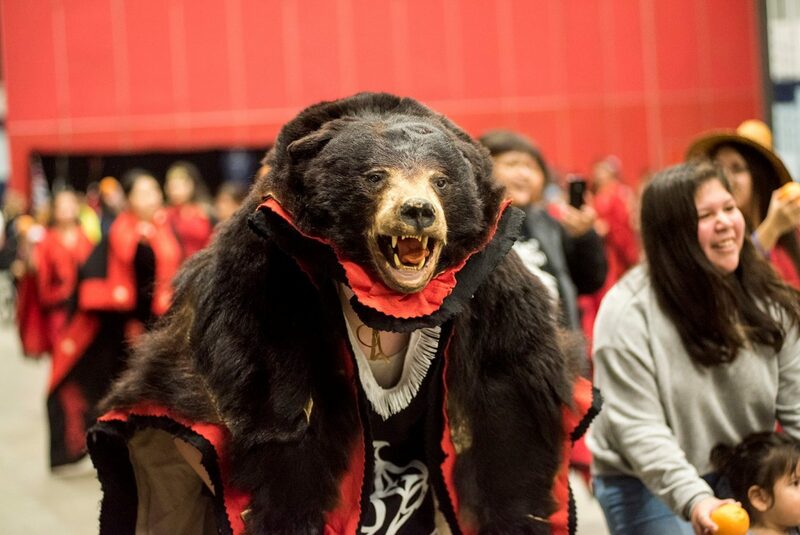 This group is made up of people from the Nisga’a nation who practice and perform traditional dances and songs. 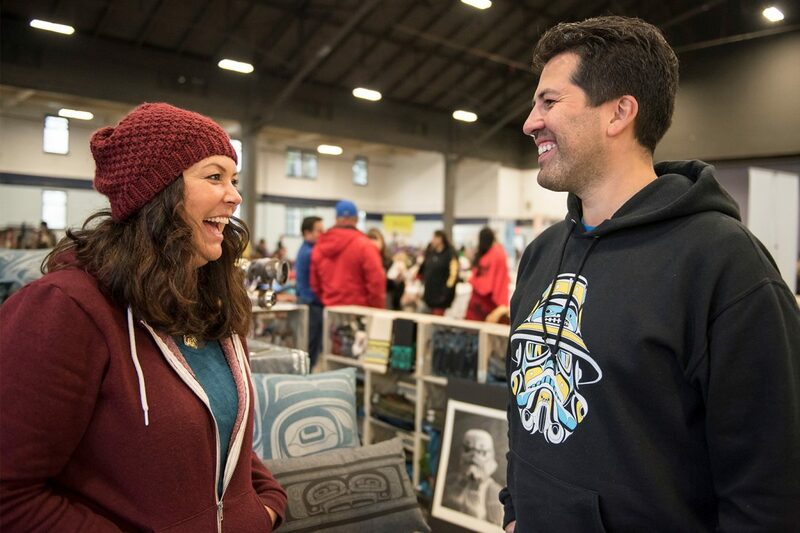 Artists Erin Brillon, a Haida designer, and Andy Everson, an artist known for his depiction of Star Wars characters with a Northwest twist, sold hoodies, t-shirts, and jewellery at the vibrant market. Other stalls sold handmade cedar hats from Haida Gwaii, bead-work earrings, and carved rock smudge bowls. Richard Mark of The Bannock Queen & Sons in East Vancouver prepares fresh bannock for the Nisga’a New Year celebration. His own favourite is hot, crispy bannock fresh out of the fryer. 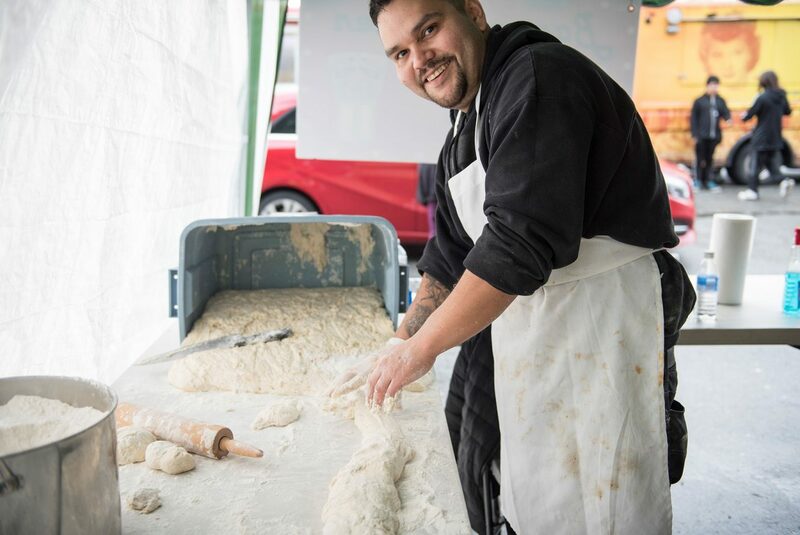 During the two-day festival, more than 3,000 bannock loaves were sold. 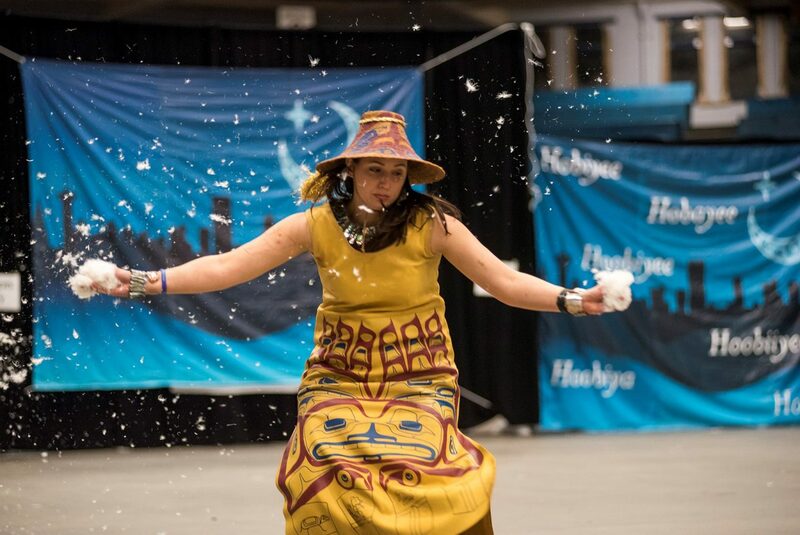 The Nisga’a people of Northwestern British Columbia celebrate their traditional new year, called Hobiyee (Ho-be-yeh), every February. Hobiyee is a celebration of the waxing crescent moon and the end of winter, with the moon and stars predicting the year’s coming harvest. The celebration also heralds the arrival of oolichan to the K’alii Aksim Lisims (Nass River). A primary source of food for the Nisga’a, oolichan is a small ocean smelt fish that leaves the Pacific to spawn upriver. It is also known as a candlefish, as it is so rich in oil that it burns like a candle. In Northwest Pacific Coast culture, songs and dance are used to pass on customs, beliefs, and history as well as mark changes in the seasons. For many decades, Ottawa and the new colonial government of British Columbia banned such performances, along with traditional Indigenous potlatches. 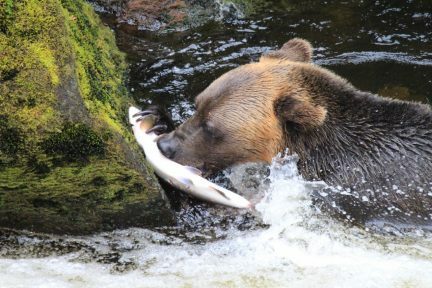 The Nisga’a had a song, “Limx Wi’idim Saak,” celebrating the roasting of oolichan; it was accompanied by a performer who wore special ceremonial regalia and danced around the open fire whilst roasting the first feed of fish. 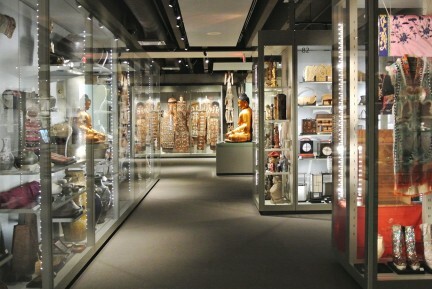 The words for this ceremony were lost because of the ban, and only the title of the song remains. But in present day there is a strong resurgence among communities to reclaim their culture, creating a new context for dances to flourish as public performances. 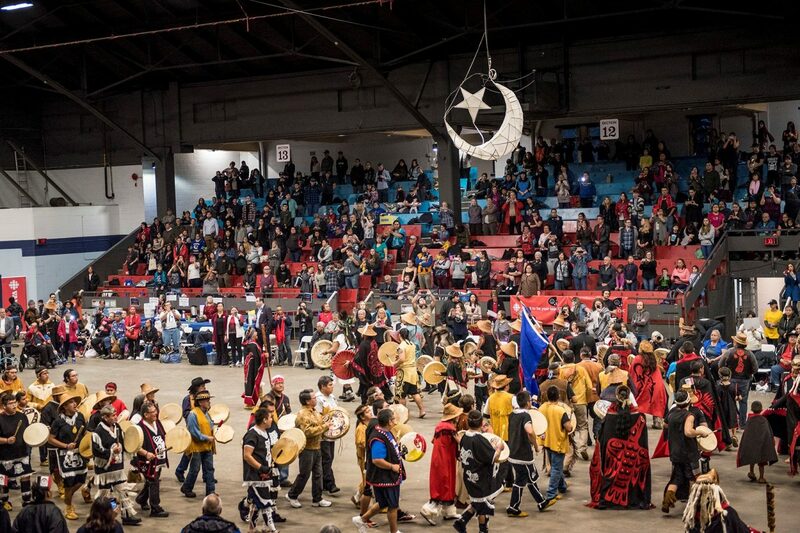 The largest Hobiyee celebrations today are found in the traditional home territory of the Nisga’a Nation, the Nass Valley, in Northwestern British Columbia and Vancouver. 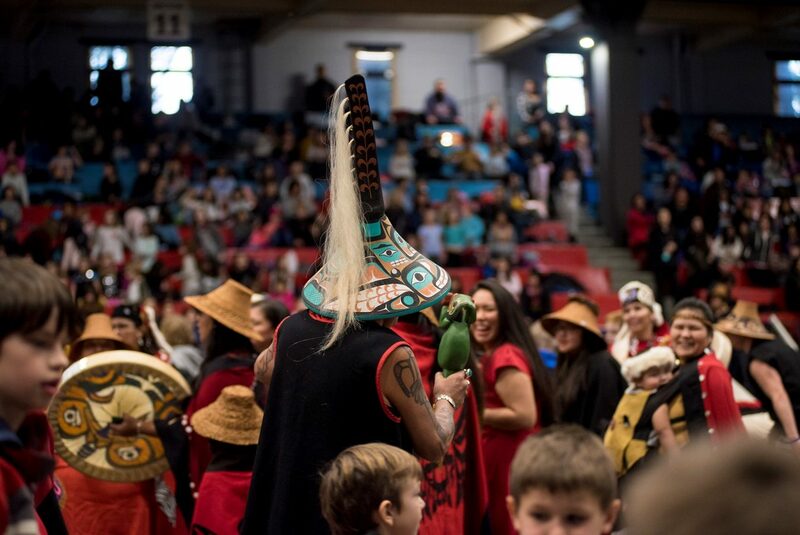 The Nisga’a Ts’amiks Vancouver Society hosts a two-day celebration annually, inviting cultural dance groups from other First Nations as well as the general public to share this important aspect of Nisga’a culture and history. 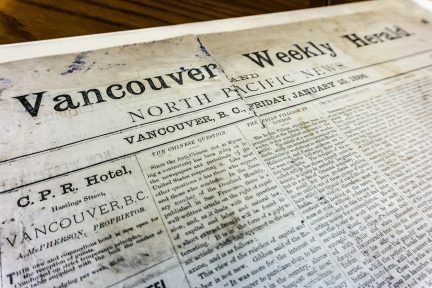 This year’s event in Vancouver took place February 2 and 3, 2018 at the PNE Forum. 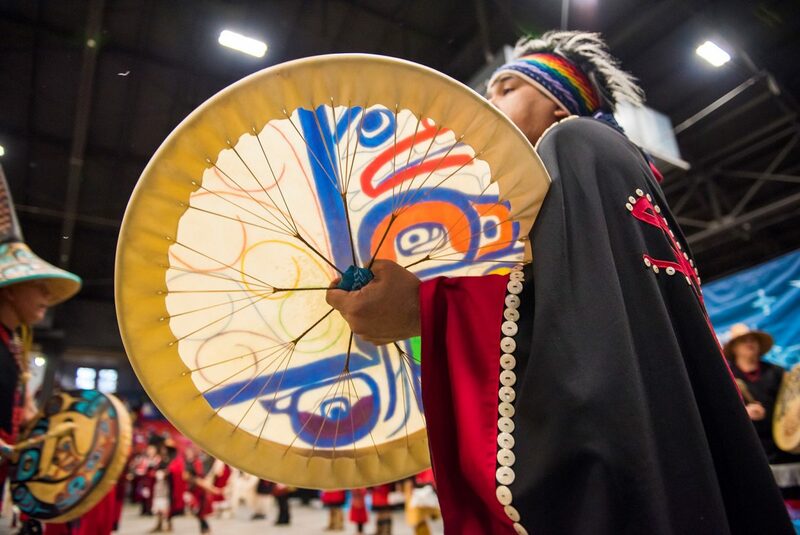 Hobiyee is an exciting and colourful celebration, with dancers wearing distinctive button blankets, chiefs donning their traditional regalia, and drums being played powerfully. This year, the MLA for Vancouver-Mount Pleasant, Melanie Mark, was in attendance. Of Nisga’a, Gitxsan, Cree, Ojibway, French, and Scottish heritage, Mark is B.C.’s first female First Nations MLA and, as Minister of Advanced Education, Skills and Training, is the first female First Nations cabinet minister. Mark danced at the Vancouver Hobiyee event, asking the crowd, “Is the heartbeat of our people strong?” The crowd whooped and cheered in response.